Back to the drawing board. Anyone have any good ideas? Well, here is a Mothers day card - just to get everyone in the mood. 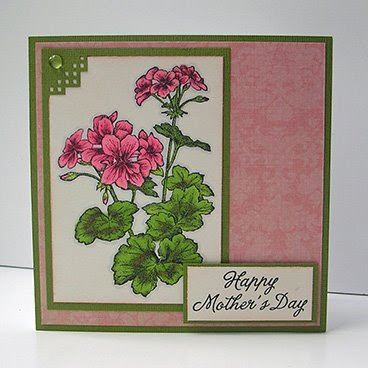 I used the Geranium Cling set from Serendipity Stamps. Its colored with Copic Markers and I "duster brushed" the cardstock edges on the image and the sentiment with Tattered Rose Distress ink. The background paper is from K&Co and cardstock is Bazzill Hillary (one of my favorite greens). I really like using that basket weave corner punch whenever I think I have too much white space around an image. I also added a clear Dew Droplet (those are fun huh?). Tomorrow is Garden Party Day - the inspiration picture is HERE (scroll to the bottom of the post). So share all your spotted pigs and funky chickens! this card is beautiful. Wow backordered till July that must be a very popular item. Lovely, just lovely! If your Mom shops at QVC I would recommend a gift card! Love your card....the dew drop on the corner is just perfect! 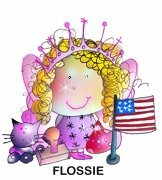 I love the stamp...makes me want to go flower shopping! !